Version 0.84 released. Syntax checker recognize lassign. Script editor plug in was improved. small bug fix in debugger. Version 0.83 released. Adapted for XOTcl1.6. Some small improvements and bug fixes. XOTclIDE is suggested and inspired by some great Smalltalk graphical environment systems as Squeak or Envy. XOTclIDE can manage even big projects with many thousand lines of Tcl or XOTcl program code. Supports component based development that helps to structure and reuse code in different applications. Enable interactive XOTcl development by using introspection functions of the XOTcl language. There is no difference in using, developing, debugging and browsing (introspection) the system. So you can work on a live XOTcl system. XOTclIDE has some powerful structure browsers. They can be used to browse class and object structure and to add and modify the methods or meta-data. XOTclIDE Object Inspector lets you browse and manipulate all XOTcl objects. You can navigate through sub-objects structures, inspect and modify variables, or even invoke objects method by GUI. XOTclIDE include a powerful syntax checking tool to find all typos at editing time. XOTclIDE can also manage normal Tcl procedures (procedural Tcl). This allows to reuse old no-XOTcl code or mix procedural Tcl and object-oriented XOTcl code in one project. 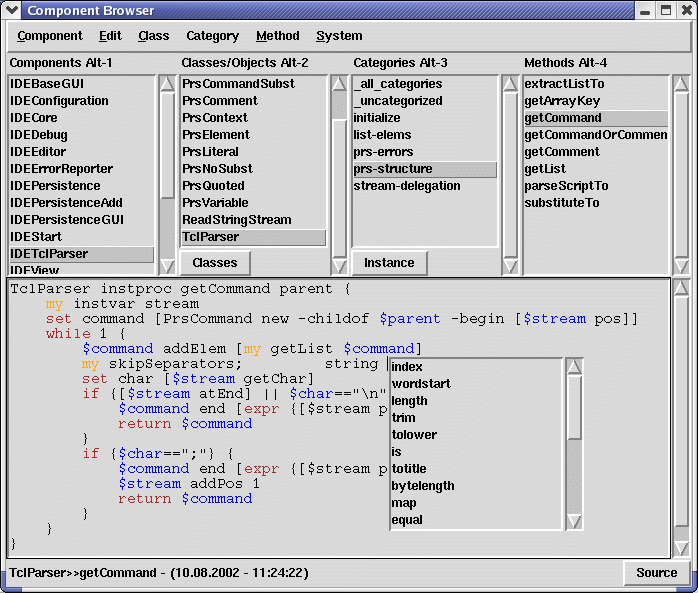 XOTclIDE can be easily adapted and extended. 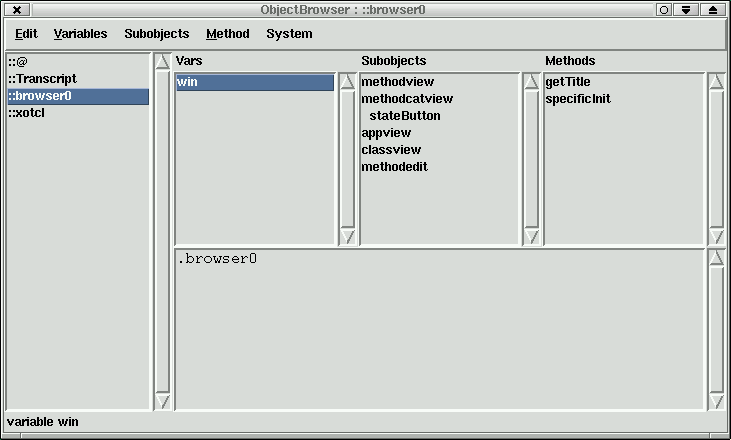 There is an Object browser (or Object inspector). You can modify the object variables and invoke object method directly from the GUI. Presentation slides from 4. European Tcl Workshop (05.2003). Making legacy Tcl code object oriented. Presentation slides from 5. European Tcl Meeting. Up from version 0.50 I decided not to implement new features and concentrate myself on bug fixes and stabilizing development. In this version XOTclIDE has everything a good IDE needs. Changes would be made only on user desire. Please write your comments, suggestions and other feedback. You can use the xotclide page on Tcl wiki to write direct your comments. You need Tcl/Tk (tcl.activestate.com) and XOTcl (xotcl.org) to run this XOTclIDE Application. xotclIDE-0.86-0.tar.gz Source files with documentation. If you want use mysql as version control database you will need mysqltcl. XOTclIDE binaries One executable run-ready exe-file (no installation is needed) for Windows and Linux Intel. You do not need Tcl installation to get it running. XOTclide on Tcl wiki Also with wish list and known bugs page. WinTclTk open-source Tcl/Tk distribution for Microsoft Windows, which contains XOTclIDE. XOMTI Project derived from XOTclIDE maintained by Fabrice Pardo. With full project infrastructure. The program was written by Artur Trzewik and is GNU Public License Software.